Healthy, large, well-established systems make for good Butterflyfish worlds. I wanted to start by saying I absolutely love your site. I am doing my best to read through as much of it as I can before I attempt my first saltwater aquarium! I apologize beforehand if any of my questions are stupid, and I'm sure there will be quite a few. Some of the first questions I have concerns the tank and stocking restrictions. The tank is a pre-drilled 58 gallon tank. The dimensions are 36 inches long, 18 inches wide and 21 inches tall. I plan to have a sump as well as a 29 gallon aquarium converted into a refugium for filtration. In a tank this size, what sort of fish am I limited to? I have a huge interest in butterfly fish as well as Centropyge angels. Specifically, I am interested in Genicanthus watanabei, Chaetodon collare, and Centropyge flavissima. Hello, I was just wondering if I could get your input on a Butterflyfish in a 46 gallon bowfront tank. This will be a FOWLR and maybe some macro algae. <I'd count your proposed Centropyge as the centerpiece and call it a day. I would like some information or your opinion. I am moving from an apartment to my own house, I have a 120 gallon saltwater aquarium that is a fish only with live rock, refugium and protein skimmer, the tank is 5 feet long. When the tank is in it's final place and setup I would like to add some butterfly fish to the tank, now the tank has a Regal Angel, African Flameback Angel, Yellow Tang, Leopard Wrasse, Yellow Goby and a Klein 's Butterflyfish, so if any, what piece of equipment could I add on to make this tank best for harder to keep butterflies like raccoon 's or false falcula's, was thinking a canister but would a wet dry be better? <The wet/dry or sump would be much, much, better and still allows you to use chemical media. May want to read here as well. and also would like to add led lights which are best for this setup , I do like the pendant's. <Obviously you won't be having corals with a Raccoon in mind, so an intense LED fixture wouldn't be necessary, and your budget (if any) should narrow down the choices for you. I'd just Google and see what's available for your needs. Might help to read here first. I just spoke to you guys about whether or not I could have any Anthias in a 55 gallon fowlr and the results were as I figured. That's ok though. I would like to know if maybe I can have any Butterflyfish that are not too difficult to take care of in a 55 gallon long fowlr? Thanks in advance. P.S. there is nothing in the tank yet. Just getting some ideas. <May want to read here first and ensure you can provide for their needs/requirements. There aren't too many Butterflyfishes that will be happy in a 55 gallon system. The Pyramid Butterflyfish is one species that is hardy and could thrive in a 55 gallon tank. <<Mmm, no. 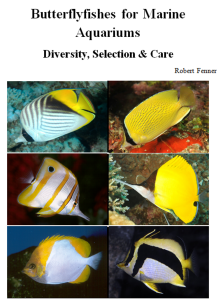 RMF>> It's also recommended to get a few months age on the system before adding a Butterflyfish. Learn to use the search tool on our site and it will lead you to most any information you seek. A link to our marine index can be found here. I am stocking my 90gal FOWLR very slowly and it's been up and running for a little over two months now. I know Bob states to wait a while before adding any butterflies but what about a Heniochus (considering it's the hardiest of all butterflies)? If not a Heni, I was considering a Flame Angel. As of right now I have a Clarkii clown and 3 Yellowtail Damsels. Ammonia and nitrite are zero, nitrates are 15. I have two canister filters running along with a UV with a total of 900 gph. Tank is heavily stocked with about 55lbs. of live rock. I'd appreciate your input on this matter. <Butterfly Fish require pristine water quality, and with a 15ppm reading of nitrate, on a tank a little over two months old.........Mmmm, do consider getting a protein skimmer for your system before adding any sensitive fish. Do read here.